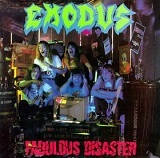 It seems every second thrash band that comes along these days is accused of stealing riffs from Exodus. Fair enough too, because if you’re going to steal riffs I suppose it only makes sense to steal from the richest catalogue of riffs around. We all know Exodus recorded a debut that would cast a shadow over the discography of most bands, but thankfully they were not even close to being finished after unleashing Bonded by Blood. If you’ve never explored past it into the Exodus canon at large, then you have been denying yourself the sheer neck-snapping pleasure of Fabulous Disaster all these years. Well, that would be a terrible oversight which I couldn’t in good conscience allow to continue. Gary Holt is a riff machine. Fact. No other guitarist in the annals of Thrash can be so consistently relied upon to provide quality riffs time and time again, album after album - this guy is the Tony Iommi of Thrash. Holt is personally responsible for some of the greatest riffs to ever inspire a mosh, and Fabulous Disaster is home to several of his best. The proof is right there in front of you, just play the title track. Or you could play The Toxic Waltz. Or Verbal Razors. Or Corruption. For anyone listening to those songs right now, my argument will require no further embellishment. The rest of you will just have to take my word for it, but suffice to say that any one of those songs by itself contains more classic riffs than some guitarists have managed in entire careers. Amazing though he is, it would be unjust to give all the praise to Gary Holt. This album was recorded by a pretty freakin’ excellent line-up of Exodus. Rick Hunolt is the band’s quintessential second guitarist as he provides easily the best counterpoint to Holt, and they always have great interplay. On Fabulous Disaster, they combine to rip apart the tracks with a series of excellent leads, always with a sense of respect for what is appropriate to each specific song. Rob McKillop and Tom Hunting deserve credit, too. They were one of the most underrated rhythm sections in Thrash, with Hunting in particular being a master of his kit. The final piece of the puzzle is, of course, Steve “Zetro” Souza, a vocalist whose inimitable style and overall influence cannot be ignored in the history of this genre. Souza’s unique delivery helped to pioneer what are now considered some of the key characteristics of Thrash vocals, and Fabulous Disaster represents the pinnacle of his career output. His delivery on this album is practically flawless, all his vocal lines are almost instantly memorable and he makes the songs insanely catchy. He had a rare ability to identify the exact placement at which his words might have the most impact over any given riff. Just listen to the chorus from The Toxic Waltz, or even the title track. Each song has an equally iconic chorus, and that’s thanks in large part to Zetro’s capacity for combining his signature aggressive delivery with a keen sense of rhythm. So if you feel like discovering a cornucopia of riffs so awesome that other bands can only dream of writing them, wrapped up in songs so catchy you can’t get them out of your mind, please accept the following advice: Stick in a copy of Fabulous Disaster and press play. Enjoy.